Long before I arrived in the Provençal village of Roussillon, I'd heard his name. If the word of my parents, (who lived here before me), was anything to go by, this was the man who could provide virtually anything from his little shop. I tried to put a face to the name in my imagination, to locate the “Cicada Grocery Store” on an imaginary street. Whenever I asked about how I would be able to get hold of this or that, I heard the mantra “Daniel will manage that for you”. So this man, whoever he was, had a lot to live up to. But this man doesn't merely sell food. Oh no, that would be far too pedestrian. He advises, recommends, offers cooking tips, promises to procure whatever you want that isn't actually found on his shelves. He is an expert on everything that passes through his hands. 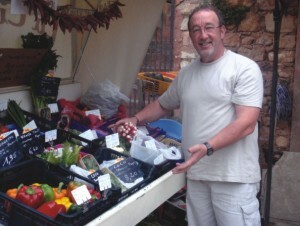 He knows the local farmers personally and tours their farms to pick up their produce. Don't buy a bottle of wine here if you're in a hurry, as the transaction needs time for him to caress the bottle, evoke its qualities, list the prizes it has won. So ladies and gentlemen, we are talking here of a Food Artist. But more than that, a Food Activist. It was my initial intention in talking to him to concentrate on nothing more than good food, leaving politics entirely to one side for once. But the moment you begin to explore any subject in contemporary France, politics is never far beneath the surface. It's his personal mission to support the small producers who are continually squeezed by the barons of the massive supermarkets that dominate the agrofood industry here, to the point where the farmers can hardly even operate without making a loss. There's not much one man can do, or even several men, against the sheer power of the big cheeses, but it's important to try, preserving in the process not only livelihoods, but a whole traditional way of life built around growing quality fruit and veg, and bringing it to market. Driven equally by a sense of duty to the village, (where he is the only grocer), life in this role is rewarding and satisfying. But it's not easy by any means. The mere arrival of a new grocery store in the village, and run by an “outsider” to boot, (anyone from more than 5km away earns this title), had the potential to upset locally-established entrepreneurial families who saw the patch as their own, and it's taken years to win the trust of the older and more conservative villagers. Then there are the economic challenges. Despite the quality produce on the shelves, and the upmarket image, Daniel takes home a mere 600 Euros a month, in a country where the minimum wage is twice that at 1300 Euros (around 1.3 lakh taka), and the cost of living is continually rising. Luckily, his wife, who is a child minder, brings in a modest but respectable salary. At the shop, margins are tight, and in the fruit and veg business there is always the problem of having to jettison produce past its best, meaning he has to monitor his purchases constantly. On top of that, custom is highly seasonal, dying off virtually completely in winter as many residents, whether French or foreign, leave their second homes in the village and most of the shutters remain firmly closed till the sun comes out again the following Spring. He reckons 60% of his customers are foreigners, but as the infamous crisis bites just about everywhere in Europe, the stream of tourists threatens to slow to a trickle. So possibly no more crowds of Japanese and Chinese visitors, prodding vegetables and snapping photos in the shop, amused and intrigued by the very existence of such a small treasure trove, so unlike anything they can find back home. Still, undaunted by the economic stormclouds, he has expansive plans, including the opening of a mini-market just up the road, which will necessitate a sizeable bank loan, but could lead to a more prosperous future. Looking at him operate in his shop, you'd think he was born with a dozen eggs and a kilo of asparagus in his cot: a natural. Indeed he describes himself as a born salesman, although the phrase in French, which translates as: “a salesman in my soul” is much more evocative. But the surprising thing is that his shop is a mere three years old. Before that, he was a travelling salesman for electrical equipment and repair systems with a major international company. Constantly on the road, away from wife and daughter, overnighting in anonymous hotels. But the market was already changing, orders dropping off, and customers more and more reluctant to invest in new equipment. So like my Dad, who abandoned his father's gentleman's outfitters after decades of dutiful service to become an actor, and indeed like my own recent leap from the world of education consultancy into the world of translation and music, Daniel, who is 53, looked around himself in mid-life and decided he didn't necessarily like what he saw. However, far from being one of life's long-sufferers, he decided to act, to become an agent rather than a victim of his own existence. All he knew was that he loved cooking, and food in general, and so he decided to let that be his guide. Now, in his third year of operating, he claims his business is turning a corner and starting to make a profit. It's been tough, and not without risk, but when asked, he draws on his cigarette, reflects, and then says he hasn't regretted the transformation for a second. There's a French expression “il est bien dans sa peau”, which translates literally as “he's fine in his skin”. It's used for people who seem at peace with themselves, fulfilled. And you can't help applying it to this extrovert grocer. As we sit chatting, we're often interrupted by customers looking for fresh lettuce, a pint of milk, a soft drink, or a punnet of brilliant red strawberries. One of this morning's visitors is a white-haired old peasant, his face creased with the strain of making ends meet for decade after decade. I sit patiently outside the shop looking in. Suddenly, out of nowhere, the two men are singing in unison. The words “I love ham and sausage” float through the air, set to a jolly tune, interrupted by a peal of laughter. And at that, I set down my pen, knowing that the article is complete, and that in this spontaneous song, in this moment of shared joy, is captured just about everything I want to say about my new home.